Hi. It’s Lois at Recipe Ideas Shop, telling you about Cinnamon Rice Pudding with Peaches. Today is National Rice Pudding Day, so I made some for our supper last night. Although I have eaten Rice Pudding, I had never made it. It was delicious—slightly sweet with a nice tang from the peaches. We ate ours at about room temperature, but it is good cold, too. I looked up recipes. Some add golden or regular raisins, some are plain, some add other fruits and spices. 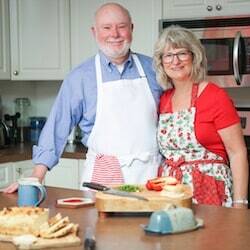 I thought the Food.com recipe sounded the simplest and easiest, and it turned out it was. Of course, I had to change it up a little bit. Don and I like cinnamon and nutmeg, so I added both to the liquids when I mixed them. The recipe takes about 45 minutes and a little fussing—as any pudding-type food does—so it doesn’t burn. But it’s totally simple. I suggest you make it early in the day so it has time to get cold before you serve it, but it tastes great at room temperature, too. Many folks are allergic to various ingredients, milk, gluten, nuts, eggs, and soy being the top culprits. 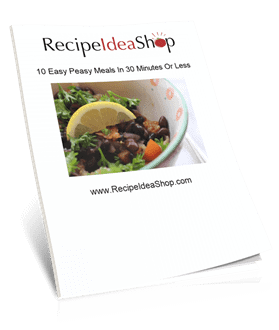 This recipe is gluten free, soy free and nut free. It is not dairy free, but it could easily be so. I used my A2 milk; you can use any milk, including a dairy free alternative (my preference is Oat Milk when I don’t have my A2 milk). I am unable to drink commercially produced milk, which generally comes from Holstein (or mixed genetic) cows. They are bred for higher volume, less fat milk production. And their milk contains the A1 protein, which causes havoc with my system. I have found that I can eat goat’s milk products, most hard cheeses, and fermented products like yogurt and sour cream without causing pain in my joints or giving me digestive issues. But milk and soft cheeses that are not A2 cause severe pain for up to two weeks. Consequently, I only eat raw milk that is certified A2 milk. I do not eat soft cheeses or commercially produced milk because they prompt a high inflammation response in my joints and they bother my digestive system. A2, on the other hand, does not do this to me. Luckily, I found a way to get A2 milk nearby. Sometimes stores like Whole Foods carry A2 milk, so if you are having similar problems, I suggest you get some and try it. Read more about the difference between A1 and A2 in the Indian Journal of Endocrinology and Metabolism and Mother Jones magazine. For more about my path to healing my gut and getting rid of inflammation, see How I Healed Myself With Food. To make this recipe, I used dry and liquid measuring cups, measuring spoons, a wire whisk, a medium pan, wooden spoon, paring knife, and a cutting board. What would you use? I think you’re gonna love this. In a medium pan, bring the rice, water, and salt to a boil. When it starts to boil, reduce the heat to medium low and simmer covered for 15 minutes (or until water is absorbed). Meanwhile, whisk the milk, sugar, vanilla, cinnamon, and nutmeg until sugar dissolves. Stir the milk mixture into the rice and increase the temperature to medium. Cook uncovered, stirring frequently, for about 35 minutes, until the rice and milk are nicely thickened and creamy like pudding. Stir constantly the last 5 minutes or so to prevent burning. Reduce the temperature if necessary. Remove from heat, and pour into individual servings. Cover each serving with a piece of plastic wrap placed directly on the top of the pudding to prevent a skin. Let cool. Refrigerate if you aren't eating it right away. When serving, top with peaches or layer the rice pudding and peaches in a parfait glass. 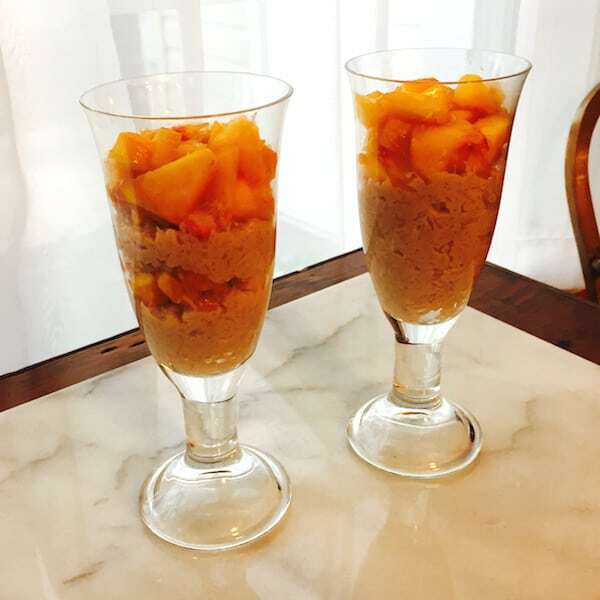 Cinnamon Rice Pudding with Peaches (Gluten Free) Nutrition Label. 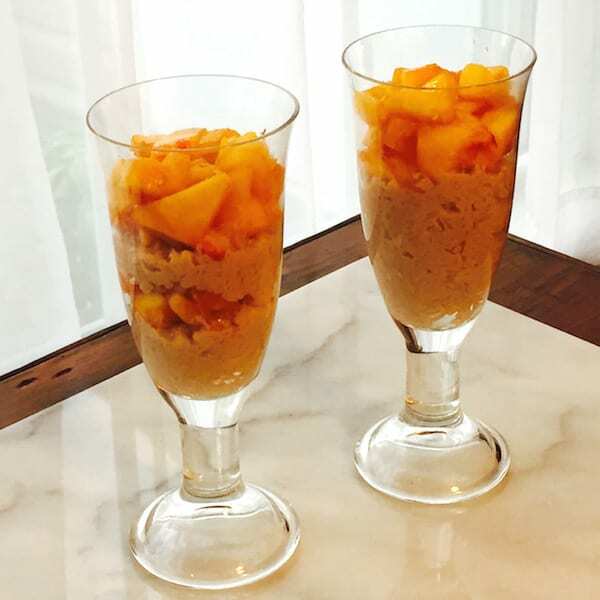 Each serving is 1/2 cup pudding and 1/2 a peach.